The risk of death for asylum seekers and migrants crossing the central Mediterranean is one in fifty. The vast majority – 95% – of those who attempt this passage have come via Libya, a country in domestic turmoil. A recent investigation by NewsDeeply details the impact of E.U. states’ politicking and policies on the security of vulnerable people who make the crossing, as well as those trapped inside Libya. European leaders have been accused of prioritising a tough immigration approach over one that responds in a responsible, sustainable manner to the crisis in Libya and the central Mediterranean. The European response to the dangerous central Mediterranean passage has been limited at best. Since the closure of Italy’s vital search-and-rescue mission, Mare Nostrum, the EU has failed to provide a service which prioritises rescue missions. Instead, privately-funded charity boats have stepped in to fill the gap as far as they can. During the first three months of this year the number of rescues by non-governmental organisations exceeded that of official coastguards. Unfortunately, the success of such efforts was met with an unprecedented backlash. The scale of physical, political and legal threats that ensued meant that by September 2017, only one private rescue vessel remained. Threats to NGO efforts came from many different sources. Boats funded by far-right groups in Europe sought to intimidate and even, on occasion, inhibit rescuers. Ironically, one such far-right vessel became itself a beneficiary of non-governmental rescue efforts after falling in to difficulties in August. The last eighteen months have also seen a spike in the number of threatening incidents with supposed members of the Libyan coastguard. 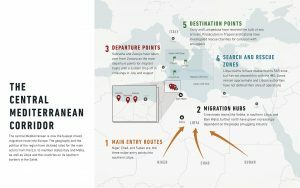 As NGOs move closer to Libyan waters, their presence threatens to disrupt rival smuggling gangs’ lucrative practice of intercepting refugees and migrants heading out from the coast, abducting them, then selling them to detention centres back on the mainland. A new code of conduct prepared by the Italian Interior Ministry included a prohibition on NGOs’ use of flares and phones while at sea, and banned the transfer of those rescued from other ships to Italy. The code was highly controversial, both within Italian political debates and beyond. 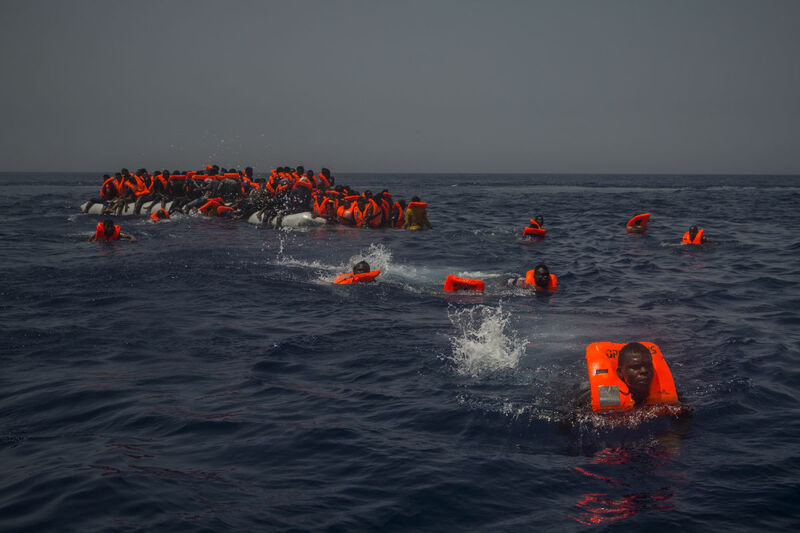 MSF refused to sign it, arguing that the new code would result in more deaths at sea. Recent negotiations between Italian authorities and the Libyan coastguard are assumed to be responsible, at least in part, for the reduced number of people attempting to cross. However, collaboration with certain Libyan groups has been accused of encouraging support for institutions which lack legitimacy, in turn precluding a lasting peace in the beleaguered country. 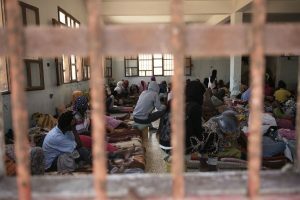 Furthermore, the international funds granted to improve conditions in detention centres in Libya have reportedly created additional incentives for armed groups to seize control of such centres, in search of both money and legitimacy. In collaborating with Libyan groups to prevent people from attempting the crossing, rather than investing in search-and-rescue efforts, European governments have been accused of leaving vulnerable people exposed to a litany of rights abuses. Libya is not a signatory to the 1951 UN Convention on Refugees: it does not offer asylum, rather detains undocumented refugees and migrants in deplorable conditions. To read the full investigation by NewsDeeply, please click here. Help Refugees funds over 80 projects across Europe and the Middle East, and with winter approaching, we are in desperate need of funds to continue our work. We are barely able to provide things as simple as food, clothes and shelter right now. To help us to continue our work supporting vulnerable people, as we enter the harshest season, please donate here.